2009 was Hello Kitty’s 35th anniversary, and Hello Kitty’s producer company, “Sanrio” launched a project “Traditional Art x Hello Kitty” where the super popular kitty collaborated with 43 traditional art studios in Japan. The collaboration crafts include Takasaki daruma doll (please read the past article “Fusion of Hello Kitty and Daruma Doll! ?”), Kutani ware, Satsuma kiriko (cut glass), Yuzen washi, Shigaraki ware, and wooden sculpture. 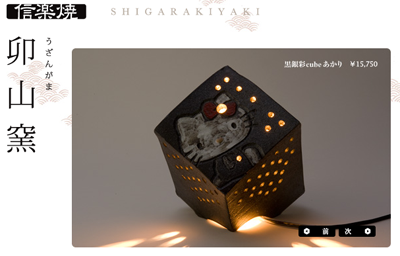 The cubic earthy lamp is perfect for Japanese style room. 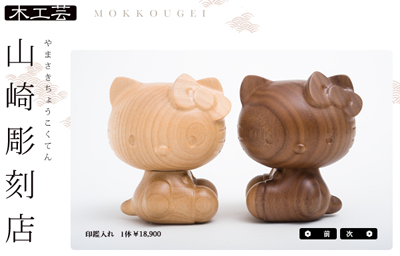 You can see more Traditional Art x Hello Kitty crafts on the official website HERE (Japanese only).